The acclaimed author of Little Broken Things returns with another “race-to-the-finish family drama” (People) about a single mother who becomes embroiled in a mystery that threatens to tear apart what’s left of her family. Jessica Chamberlain, newly separated and living with her two sons in a small Iowa town, can’t believe that a tragedy in another state could have anything to do with her. But when her phone rings one quiet morning, her world is shattered. As she tries to pick up the pieces and make sense of what went wrong, Jess begins to realize that a tragic death is just the beginning. Soon she is caught in a web of lies and half-truths—and she’s horrified to learn that everything leads back to her seven-year-old adopted son, Gabriel. Years ago, Gabe’s birth mother requested a closed adoption and Jessica was more than happy to comply. But when her house is broken into and she discovers a clue that suggests her estranged husband was in close contact with Gabe’s biological mother, she vows to uncover the truth at any cost. 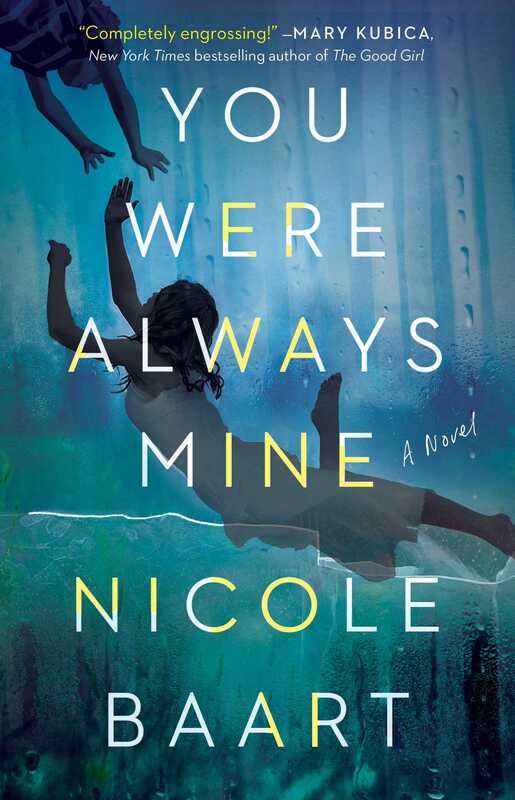 A harrowing story of tenacious love and heartbreaking betrayal, You Were Always Mine is about the wars we wage to keep the ones we love close, perfect for fans of Liane Moriarty and Jodi Picoult. This reading group guide for You Were Always Mine includes an introduction, discussion questions, and ideas for enhancing your book club. The suggested questions are intended to help your reading group find new and interesting angles and topics for your discussion. We hope that these ideas will enrich your conversation and increase your enjoyment of the book. The acclaimed author of Little Broken Things returns with another “race-to-the-finish family drama” (People) about a single mother who becomes embroiled in a mystery that threatens to tear apart what’s left of her family. A harrowing story of tenacious love and heartbreaking betrayal, You Were Always Mine is about the wars we wage to keep the ones we love close. 1. Considering her marriage, Jess thinks: “I love you . . . And I’m afraid you’ve forgotten to love me back.” Do you think this is accurate? Who do you blame for Jessica and Evan’s separation? Do you think one of them is more at fault than the other? Why or why not? 2. Jessica’s relationship with her sons is complicated. Do you agree with her parenting style? What, if anything, do you think she needs to change? 3. Evan and Jessica have one biological child and one adopted child. Are there differences in the way they treat their children? 4. It’s no secret that Max blames Jessica for his parents’ separation. Why do you think this is? Do you agree with Max? Why or why not? 5. Talking to a student, Jess says: “If you smile, they’ll never guess you’re scared.” Is this good advice? Why or why not? 6. As the novel progresses, Jessica’s feelings for Gabe’s birth mother change. Do you find her attitude at the beginning of the book understandable or deplorable? Somewhere in between? 7. Near the end of the book we find a short letter from Evan to Jessica. In it he says, “Love makes a family, and sometimes love tears a family apart.” What do you think he means? Can you relate to this sentiment? 8. One of the central themes of the novel is family. Share a bit about your own family. How have you been knit together? Do you think blood is stronger than water? Or does love conquer all? 9. Meredith’s betrayal is so ugly but her motivations are complicated. Do you understand, even a little, why she worked with James Rosenburg on Initium Novum? 10. Even when Jessica knows everything that Meredith has done, she can’t help but worry about her former best friend’s husband and children. Do you see her concern as weakness or naïveté? 11. What kind of a person is Jessica? Do you have hope for her and her boys by the end of the book? 12. Max and Gabe both play big roles in the book. What did you like about them? Do you believe they’ll be okay after the death of their father and all they went through? 13. If you had an adopted child, would you want to have a relationship with the birth family? If you gave a baby up for adoption, would you want to be in contact with the adoptive family? Why or why not? 14. The novel touches on issues of women’s rights, child neglect and abuse, and incarceration. What, if anything, did you learn? What issue touched your heart or sparked a passion in you? 1. Anna tries to show love to her stepdaughter and stepgrandsons through food and fellowship. Make some comfort food and gather your book club close for some great conversation and time together. You could have a hot chocolate bar (marshmallows, salted caramel sauce, candy canes, whipped cream, etc. ), enjoy bowls of warm potato soup, make homemade brownies, or whatever else feels friendly and inviting to you! 2. Jessica is an English teacher and there are several references to classic literature throughout the novel. Choose a short story or a few poems to share with your book club. “The Story of an Hour” by Kate Chopin might be a good choice. The entire story takes place over the course of a single hour after Louise Mallard hears that her husband is dead. There are some similarities (and many differences) between Louise’s experience and Jessica’s. Discuss these with your book club. 3. Every chapter of You Were Always Mine begins with a brief anecdotal biography of an incarcerated woman. According to the Prison Policy Initiative, 219,000 women are incarcerated in the United States (Women’s Mass Incarceration: The Whole Pie, October 19, 2017). Take a moment to write a letter of encouragement or find some other way to alleviate the suffering of a woman in prison. A quick Internet search will turn up many resources, but if you’re not sure where to begin, check out PrisonFellowship.org, ThriveGlobal.com, or WagingNonviolence.org. 4. Evan let his obsession come between him and his family. Have an array of blank cards available at your book club gathering and encourage attendees to take a moment to write a note reaching out to a family member or friend. It could be someone they haven’t talked to in a while, or just a loved one that they want to encourage. Never underestimate the power of a handwritten letter! Nicole Baart is the mother of five children from four different countries. The cofounder of a non-profit organization, One Body One Hope, she lives in a small town in Iowa. She is the author of eight previous novels, including Little Broken Things and The Beautiful Daughters. Learn more at NicoleBaart.com. "Tense, emotionally-charged, and at times frightening, You Were Always Mine opened my eyes to the dark side of adoption. With characters that are true to life and a tremendous depth of knowledge into a shocking subject matter, this is Baart's best book yet. Completely engrossing!" Mothers everywhere will recognize and celebrate the fierce, imperfect strength of Jessica Chamberlain as she tries to parent her sons—one birthed and one adopted—in the wake of her estranged husband’s death. A startlingly authentic mix of suspense, grief, and family drama, You Were Always Mine reconstructs the pieces of a shattered life to reveal the darkness that destroyed it. You will never look at adoption the same way again. "Equal parts tear-jerker and page-turner . . . Entwines the heartbreak of a mother's struggle with the urgency of a mystery that won't let her (or you) go. Compelling, heartfelt, and satisfying to the breathless finish." "Baart brilliantly weaves mystery into family drama...The clues are left in plain sight, leaving the reader on edge trying to solve the puzzle before it’s too late. The conclusion is both sinister, and shocking. This is domestic suspense at its best." "Original, chilling, and frighteningly realistic. With a mother we adore and children we root for, this sinister and heartbreaking family drama will have you turning pages as fast as you can. Clear your schedule and prepare to be wowed!"